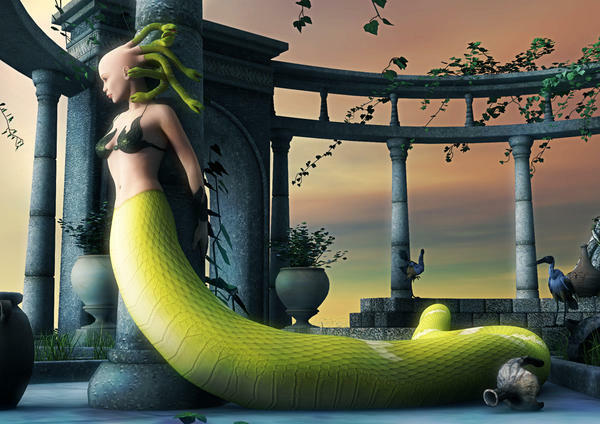 The Gorgon brings myth to life in a whole new way. Through the power of Genesis you can create a whole race of Gorgons. With options for seperate snake body or gorgon head you can create a wide range of creatures, from the classic gorgon to alien or fantasy creatures of all shapes and sizes. Mix and match however you like with any existing genesis character morph. If you buy both sets at the same time you will receive the Gorgon Extreme set for 50% off instead of simply 20% off. 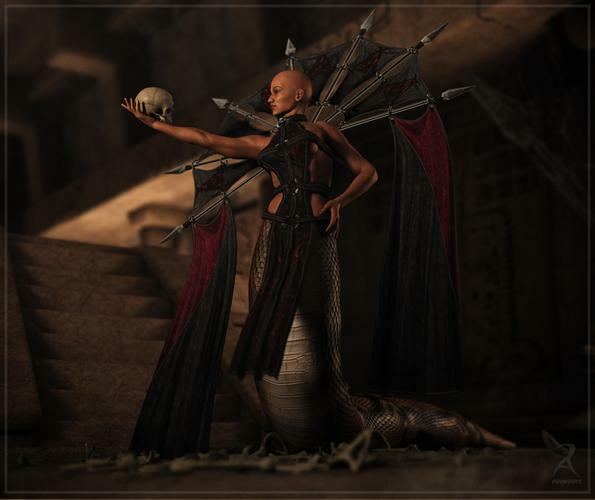 Eight dynamic new styles for the "Gorgon Medusa" character set. 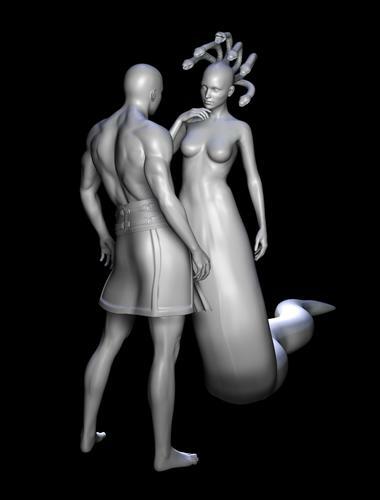 Add some realizm to these characters with snake patterns based on real world snakes. Very cool, will save me the effort of hacking this together myself. Looks good. Very cool. Can't wait to see how you set up the snake tail. Nice to see male and female gorgons together! Very well done. Wow. I've been wondering what you were working on next. These are going into my cart as soon as they are released. Is that all geografted? It looks very flipping cool! Well that just rawks... sorry I can't afford to spend any more for a while, but I'll be putting it on my wishlist! Thanks RA! any chance of a rattlesnake tail morph? I need to get my jaw, because this is jaw dropping amazing. Wow you are so good! With these promo images and the stuff I already have of yours, you do great! Woah!....can count on you to take things to places I didnt even dream about. Off to check how much of my gift certificate is left...very cool! Has anyone noticed that offer to get 50% off "Gorgon Xtreme's" current price if you buy it with "The Gorgon". I thought it was great for price then checked my cart to find out that it's not as low as you think. The end price should be $15.13 but ends up being $16.33. 50% off of $9.56 is $4.78 plus $10.35 equals $15.13, right? Can any one explane how that happened? Could you (or anyone else) post a picture of just the tail? I'm interested in seeing how it fades into the body, whether it's a transparency map or if the mesh is hard-edged. Sorry, let me rephrase; I'm interesting in knowing how the texture from the tail blends into the female body. Is it made to look like it's fading via a transparency map or will the texture end rather abruptly? It looks more like it ends fairly quickly when reaching the human body, and the first thing I'm going to try to do is to blend it more smoothly if at all possible. Rawn, do you happen to have your original PSDs for your textures? I would like to try and make a transparency map that allows the tail to blend into any skin texture, but I'll need versions without the little skin area to attempt it. I plan on doing it for my own work regardless, but I'd like to be able to make something that I could share with other users if possible (and if I do it just for myself, it won't be anything I can share since I'll be editing the textures themselves). If not, I'll understand though. That is an annoying limitation, but very hard to avoid with the way GeoGrafting works. I can see two options, both requiring LIE presets to be added over the top: either use a masked scale area on the lower part of the remaining Genesis body to blend into the existing skin texture (which would of course move the join up on the body) or if the tail's upper portion had the Genesis mappings (which would require DAZ' blessing) use a similar blend mask to transition to the scales on the tail. Tricky to set up either way. Since Richard answered that question better than I could...I will just post some art.